Recently, forage testing laboratories have begun to evaluate forages for neutral detergent fiber (NDF) digestibility. Evaluation of forages for NDF digestibility is being conducted to aid prediction of total forage digestibility. There are several important reasons why forages are being evaluated for NDF digestibility. First, research has demonstrated that lactating dairy cows will eat more dry matter (DM) and produce more milk when fed forages that have higher NDF digestibility. Second, while lignin and acid detergent fiber (ADF) have been used in the past to estimate the potential digestibility of NDF and total forage digestibility, recent research has demonstrated that ADF and lignin do not account for all the variation in NDF or forage digestibility. Third, forage digestibility is calculated in the 2001 Nutrient Requirements of Dairy Cattle (NRC) using a summative approach where energy contributed from protein, fat, non-fiber carbohydrate (NFC), and NDF are summed. A prediction of NDF digestibility is required to use a summative energy prediction for forages. There is, however, debate among forage testing laboratories and academics as to whether in vitro digestibility of forage NDF should be measured by incubating forage in rumen fluid for 30 or 48 hours. This Focus on Forage will discuss issues associated with 30 and 48 hr in vitro NDF digestibility determination on forages. How do 30 vs 48 hr in vitro NDF digestibility determinations differ? In vitro NDF digestibility of forages are evaluated by incubating forage in buffers and live rumen fluid, at body temperature, under anaerobic (no air) conditions. The only difference between a 30 or 48 hr NDF digestibility determination is the length of time (30 vs 48 hr) the sample is incubated. Because 30 hr in vitro NDF determinations are incubated 18 fewer hours, 30 hr in vitro NDF digestibilities values are logically lower than 48 hr in vitro NDF digestibilities values. 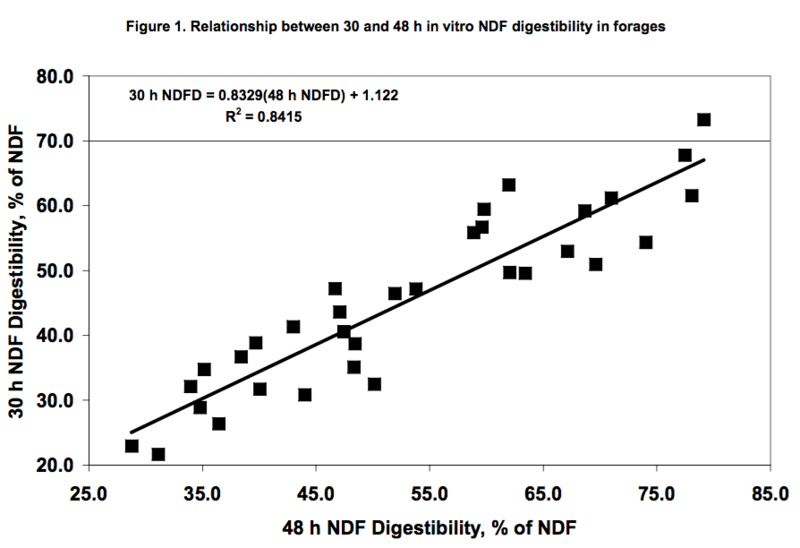 Across all forages, 30 and 48 hr in vitro NDF digestibilities are strongly related (R2 .82), Figure 1. 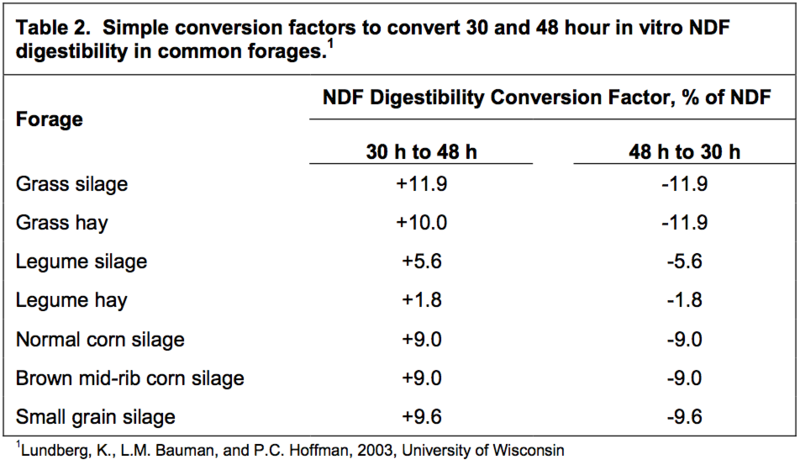 Between types of forages, however, the relationships between 30 and 48 hr in vitro NDF digestibility are different, and differences between forage types should be accounted for. For grass silages and hays, the differences between 30 and 48 hr in vitro NDF digestibility are approximately 9.0 to 12.0 percentage units (% of NDF). Differences between 30 and 48 hr NDF digestibility for legume silages and hays are much lower, at 2.0 to 5.0 percentage units. 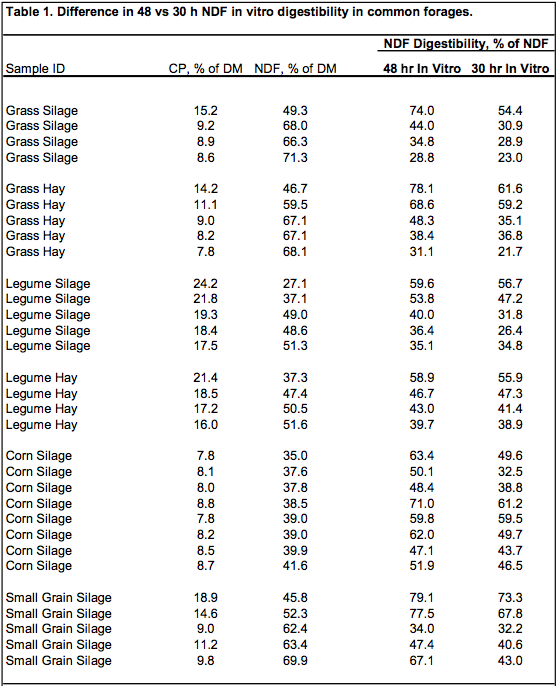 For corn silage, differences between 30 and 48 hr NDF digestibility are commonly 8.0 to 9.0 percentage units. Differences in 30 vs 48 hr NDF digestibility in common forages are listed in Table 1, and simple coefficients to adjust NDF digestibility values from 30 to 48 hr or from 48 to 30 hr are presented in Table 2. These coefficients are only a general guideline to help users reference their NDF digestibility values to literature NDF digestibility values or to their preferred NDF in vitro incubation time (30 or 48 hr). These coefficients are not intended for use in lieu of actual laboratory in vitro NDF digestibility values. Which is better, 30 or 48 hr in vitro NDF digestibility? This is a very complex question with a simple answer: It depends! Measuring NDF digestibility using 30 or 48 hr incubation times each has advantages and disadvantages. The advantage of 30 hr incubation is that it may better represent the amount of NDF digested by a ruminant (cow) at maintenance levels of intake as compared to a 48 hr incubation that may slightly over express NDF digestibility at maintenance intakes. It is important to understand that in vitro NDF digestibility is measuring how much NDF a ruminant can digest at a maintenance level of intake (no milk production, no growth). The maintenance NDF digestibility values of forage are then used as a part of summative equations to predict total TDN of the forage (NRC, 2001). The TDN content of forage is then converted into more complex energy values such as net energy of lactation, growth, maintenance, etc (NRC, 2001). The disadvantage of 30 hr in vitro NDF digestibility determination is the in vitro NDF digestibility assay becomes less repeatable when lesser incubation times are used. Thus, if 30 hr NDF digestibility is not determined with due diligence, using proper equipment and procedures the result could be an actual under-prediction of NDF digestibility leading to an under-prediction of forage TDN (energy) content. The advantage of 48 hr in vitro NDF digestibility determination is the laboratory assay is more repeatable because the incubation time is longer. In contrast, 48 hr in vitro NDF digestibility determination may result in a slight over-prediction of forage NDF digestibility especially for grasses and ultimately and over- prediction of forage TDN content. It should be remembered, however, that the influence of NDF digestibility on total TDN prediction of forage is reasonably small in relationship to all of the factors that influence energy status in ruminant animals. 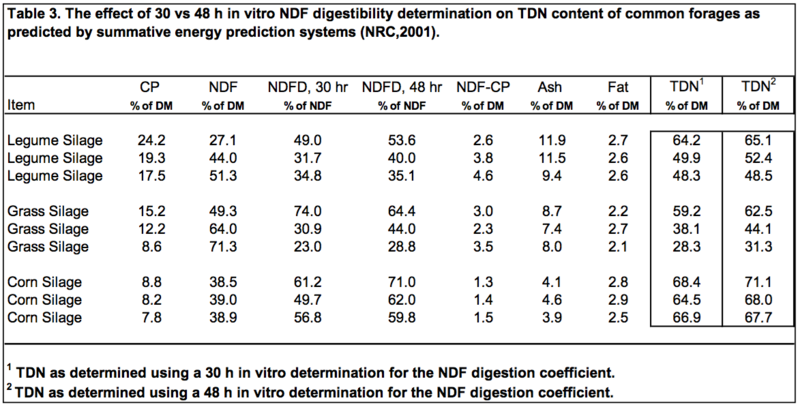 In Table 3, the TDN contents of 9 forages are predicted via NRC, 2001 summative equations using either 30 or 48 hr in vitro NDF digestion coefficients. Note that the predicted TDN values vary only 1 to 3 TDN units. Wouldn’t even shorter in vitro NDF digestibility incubation times such as 16 or 24 hrs better represent NDF digestibility in high producing lactating cows? Maybe, but this is not how traditional energy systems work in ruminant nutrition. A simplified explanation of ruminant nutrition energetics is as follows. As dairy cows produce more milk they eat more feed (or vise versa). As dairy cows eat more feed the feed passes through the digestive tract faster and the actual or true total tract digestibility of the feeds is less extensive. This effect is for all feeds, forages, grains, protein supplements etc. This overall concept of depression in total digestive tract digestibility of feeds when intake increases is well known and eloquently defined in ruminant nutrition models (NRC, 2001). As a result, ruminant nutrition models such as the NRC, 2001 discount feed digestibility based on level of intake and milk production. The adjustments are commonly referred to as adjustments to 1x, 2x, 3x, 4x, or 5x levels of maintenance intake. Because of this it is most logical for laboratories to express feed (or NDF) digestibility at a 1x level of intake first and let well-recognized, researched energy equations and models make the adjustments in diet digestibility to different levels of maintenance intake (which are producer specific) thereafter. Secondly, 16 hr or 24 hr NDF digestibility measurements have a much higher laboratory error rate as compared to 30 or 48 hr in vitro NDF digestibility determinations and databases for comparison of results are extremely limited. What is the bottom line with 30 vs 48 hr NDF digestibility? The bottom line with 30 vs 48 hr in vitro NDF digestibility determinations is to simply understand the strength and weaknesses of each incubation time. Either incubation time (30 or 48 hr) can be used successfully in ruminant nutrition programs. The variances of NDF digestibility between 30 and 48 hr incubation times should not be lost in the larger issue. That being, NDF digestibility of forages can vary as much as 40.0% percentage units (% of NDF) and can greatly affect the energy content, intake potential and animal performance associated with forage. When determined and used properly, either 30 or 48 hr in vitro NDF digestibility determination systems can define this variance and improve the overall understanding of forage utilization potential. National Research Council. 2001. The Nutrient Requirements of Dairy Cattle, 7th Revised Edition. National Academy of Sciences, Washington, D.C.